Spring has given way to summer at RLG, bringing some familiar faces as well as some surprises! Late May and early June signaled the change from spring to summer at Reserva Las Gralarias with corresponding cloudless days and many exciting sightings! 22 May 2016: Volunteer Ray So released the final 17 tadpoles of the 24 Centrolene peristictum glassfrog eggs that hatched in our lab. Not much larger than an eyelash, these tadpoles are the next generation of the small glassfrogs found in Lucy’s Creek and famous for the male’s careful cleaning and maintenance of several egg masses laid on one-creekside leaf. 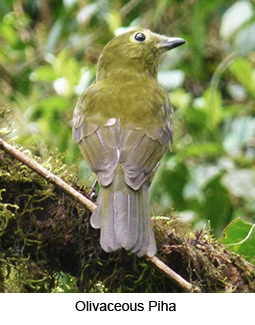 Last week of May: The practically silent, rare and enigmatic Olivaceous Piha was observed several times along Parrot Hill Trail. Plus we were treated to wonderful views of flocks of Barred Parakeet, Maroon-tailed Parakeet, Blue-fronted Parrotlet, Red-billed Parrot and two flocks of 18 and 21 very noisy individuals of Scaly-naped Amazon. First half of June: As soon as the summer sun dominates the mornings many critters are quick to take advantage: birds preening high in the trees in the sunshine, butterflies flitting through the gardens, Roadside Hawks calling as they soar overhead, large kettles of Swallow-tailed Kite circling low in the sky prior to their migration eastward. And all of a sudden there are flowers in full bloom, especially the Asteraceae that our butterflies love, while the flowering orchids decline and the forest mushrooms fade. But no doubt our best and most exciting sighting was of a male Lyre-tailed Nightjar regularly perched on a wall in front of the door at the guest house, even flying and displaying over the cars parked nearby! By 15 June we also watched a female feeding and perched as the male sang its rather bizarre song. Early June: Keen to have one more nest of soft moss before it dries out over the summer, our hummingbirds gathered spider webs and bits of moss to construct their last nests of the season. 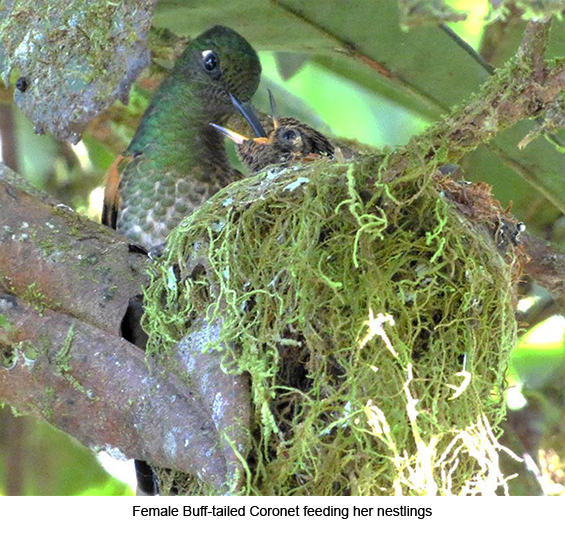 By 4 June a female Buff-tailed Coronet had her nest ready and a few weeks afterwards was feeding 2 nestlings. We also watched panicked fledglings of Gray-breasted Wood-Wren and White-sided Flower-piercer as they skittered like mice around the patios. And we were very excited to see Arrayán seedlings! 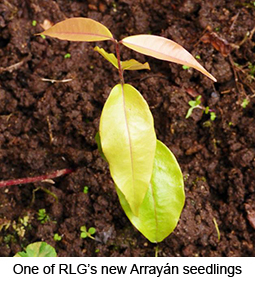 In early December 2015 we collected the seeds from anArrayán tree that we had planted as a seedling about 11 years go. We planted seeds in our seedbed and almost exactly six months later the delicate red stem and shiny leaves of this myrtle (Myristacaceae discolor) appeared. We now have two generations of this important primary forest hardwood helping to regenerate previously pastured areas of the reserve. And even though the fruits have a very sweet fleshy covering, we now know the Arrayán seeds do not need to be scarified or eaten by anything in order to sprout. 4 June 2016: Monkeys!!! A troop of 4-5 monkeys was observed in mid-afternoon by guests from the patio behind the guest house. Scrambling through the tops of the trees one of the monkeys was seen well. This observation adds a few more details to the previous four sightings, always too brief for photos but always described as 4-5 individuals, large, brown (definitely not black), long tail and ‘simple’ (i.e., no color patterns or obvious adornments such as ruffs or beards, etc), no sounds made. They always swing/scamper quickly high in trees making a lot of movement in the branches which is what draws the attention of the viewers. We hope to someday get a photo of them to be sure of the ID! 12 June: We were surprised by the appearance of a beautiful and uncommon lizard, Stenocercus varius, who ventured out to enjoy the sun behind the patio at the guest house. 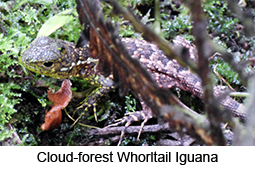 An endemic species of the Pacific Andes of Ecuador, this Cloud-forest Whorltail-Iguana is classified as Vulnerable and in the Mindo area has only been found at Las Gralarias. 19 June: We heard the first-of-season song of a male Crested Quetzal. These quetzals come to RLG early in the summer to nest. 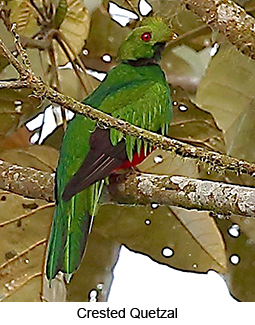 They are not well-received by our resident Golden-headed Quetzals but for the rest of us they are a sure sign of our summer’s delightful and very special treats. Speaking of treats, we can't help but include a photo of one of RLG's amazing summer sunsets. Plus, the full moon on the summer solstice on the equator is a sight worth sharing. One is a Glorious Number! The truth is, conservation is difficult, and protecting the biodiversity of this world takes the passion and energy of a lot of people working together. LGF and our supporters are doing our part and we have accomplished so much! Between land acquisitions and the RLG reforestation program, the habitat is healing. 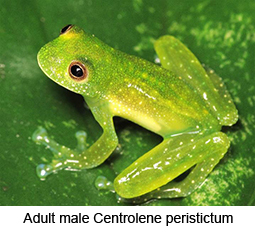 Rare and endangered species like the Bumpy Glassfrog, Centrolene heloderma, are breeding and recovering. But all of this is the result of persistent hard work, hard work which will have to span generations. Fortunately, I’m reassured LGF’s passion and preservation efforts will continue because of the work and interest of our young supporters. 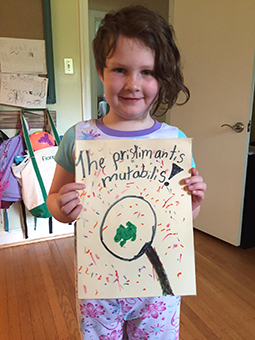 Just recently we were delighted to hear about one of our youngest supporters, a first-grader from Pennsylvania who loves frogs. Her teacher had challenged her and her classmates with the task of writing a book about an animal, and this youngster chose the Punkrocker, Pristimantis mutabilis, and created a story about the discovery of the species at Reserva Las Gralarias. By learning about the natural history of the species and sharing her new-found knowledge and her love of amphibians with others, this young girl is making a difference. She even saved her allowance and made a donation to Las Gralarias Foundation to help us protect the Punkrocker’s habitat! I have no doubt, other young supporters will join the LGF team in the future and work with us to protect the Punkrocker’s habitat for years and years to come.